Firstly thanks to the comments from Pavemental and Robin regarding ROMO from when I posted the cover featuring the infamous “Fiddling while ROMO burns” compilation tape. 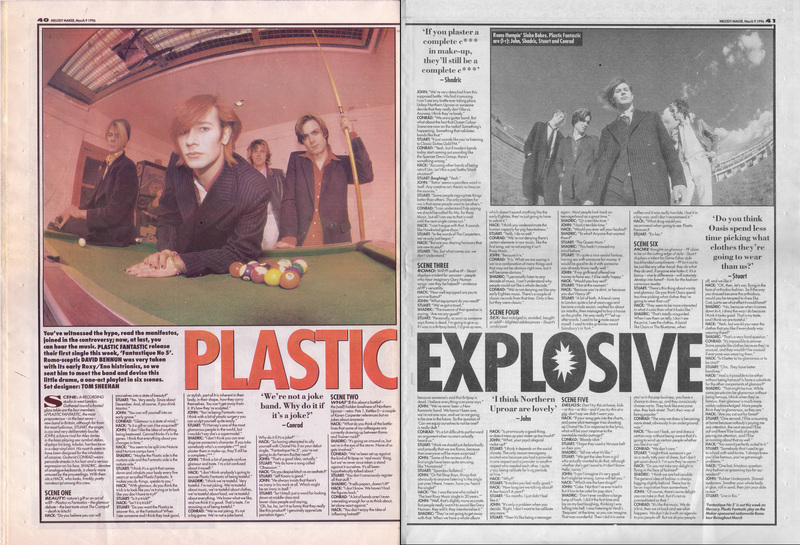 As promised here’s the David Bennun interview with long forgotten ROMO band Plastic Fantastic from 9th March 1996. I was going to write ‘justly forgotten’ just then but checked myself. I realise that if I had ever heard any of these ROMO tracks I’ve long since forgotten what they sounded like. Even if I could remember I want to hear them again with a fresh pair of ears. I’ve been searching hard for some mp3’s without much success – can anyone help? I still feel pretty confident that they were justly forgotten though. However the comment from Robin got me thinking. I remembered nothing of the scene except, as I said previously, that I remembered ROMO as the tipping point where I gave up on Melody Maker. I was probably too old by this time but I’d grown so tired of the endless conveyor belt of hype. And ROMO felt so desperate, so utterly contrived, so pointless. I only had to see a few of the pics or read some of the de rigeur ‘manifestos’ and I just knew, “I’m not having that. No way”. But this makes it seem like I still cared….like I still felt passionate enough to love and hate new bands. I didn’t. It all just bored me. Melody Maker became an irrelevance to my life. Did ROMO come before or after S*M*A*S*H and the “new wave of new wave”? It’s so hard to remember. By the time Elastica had broken I hated most of the bands I read about in the press. Nothing excited me. It was just more of the same. And again. And again. Menswear, Gene, Echobelly. Gay Dad was somewhere in the mix too. I forget. All I remember by the mid 90’s was that the latest scenes just kept coming and coming and none of them worked. Oh Mac-onie, so much to answer for….look what you went and started with Britpop. In retrospect I do admire the (possibly noble) intentions of Price and Parkes, the desire to move us on from Britpop in a less laddish, more feminine direction, but it just led us from one dead-end to another. No excitement. No challenge. 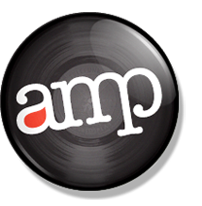 With Britpop and the Maker so mainstream I craved to hear music that was most definitely NOT mainstream and with the internet still finding its feet, the music press was still the only real viable communication channel I/we had. I wanted to discover music the mainstream would dismiss out of hand not more mainstream acts in the making. I wanted music that would surprise me. Music that I couldn’t ignore. Music that I might not like, but that would make me think. In short I wanted the journalistic equivalent of Mixing It, or failing that, a less genteel Late Junction. I suppose in many ways I still do. The closest thing I’ve found to date comes out via http://wfmu.org because while I admire Resonance FM I find it works better in theory than as an actual radio station. But enough of my pathetic attempts to try and articulate what I once wanted, here’s a brilliant, MUST READ piece from Simon Reynold’s that perfectly encapsulates the end of the MM and the part Britpop and ROMO played in its own downfall. It would be really interesting to know how Simon Price and Taylor Parkes feel about ROMO today and if they agree that it unwittingly contributed to the papers rapid decline. Let it be said that both of you were two of the brightest and best writers left along with Kulkarni so I’m not blaming you. I’m just interested to know more now that the dust has settled. Can I tempt either of you into leaving a comment? Would ROMO have been called Nu-Romantic today? Will we live to see New Labour rebrand themselves as Nu-Labour for the jaded voting youth that grew up in the 90’s? Came across this advert for the Fiddling while Romo Burns tour so thought I’d add it to this post. The dates also match the number of people that attended. Two points of order: S*M*A*S*H / NWONW was spring 1994 (and was effectively killed, in my view, by the death of John Smith and what followed), and Gay Dad were later than the other bands – a 1999 hype, in fact. But it was one of Gay Dad (possibly their drummer, would you believe!) who said that Blair was “closer to what David Bowie was in 1974 than he is to Churchill”, which in a twisted and point-missed sort of way is actually true. He was obviously closer to what Paul Rodgers was in 1974 than he was to either, though, and I suspect he’d have been proud of it. The exponents of ROMO were most insistent that it not be seen as a “New Romantic revival”, though if you were that way inclined you could see that rather cynically as a way of avoiding what during the Britpop era was the stigma of being seen to revive the 1980s. The Underworld review you have also posted must be just about the last thing in the music press to mention Kant, Cezanne and Picasso (reference points which were once far from rare). Unthinkable even six months later, probably. I felt almost exactly the same, and that period certainly marked the end of my time with NME / Melody Maker, moving on to search for other channels of interesting music. Part of why I enjoy this site is it makes me feel that it was not my criterea for good music journalism that changed, it was the writing in these papers itself, and for the worse. I was just forced to look elsewhere. Oh, and while I am here a cheeky request – any Loop interviews you feel like putting up would let me bask in a warm nostalgic drone rock glow. Hello, been quite enjoying this site. Plenty to say, no space here (might write some sort of blog post on the subject soon). In short, I’m glad we covered these oddball bands, if just as a counterpoint to the grimness of late Britpop, but putting Romo on the front cover in its raw and largely lousy state was a very bad idea (and I thought so at the time, too). Had it stayed in the live reviews section as a curiosity, moving to the cover if/when that was justified by the music, the whole thing would be (half) remembered with far more affection. Some of those bands were never going to amount to anything; others had potential, which was effectively snuffed out by the sudden, premature push. 1. Romo had nothing to do with the relative lack of coverage of whatever genuinely interesting music was being made at the time. The paper was self-consciously pop / trad-rock at the time (not my decision, I can assure you), and would only commission very small features on less conventional artists. Some of us would circumvent the problem by accepting full-page reviews of the latest in-thing dullards and tearing them apart, but that only takes you so far. A shame. 2. Romo had nothing to do with the demise of the Melody Maker. The coffin lid was closing on us already. The poor decisions which killed off the British music press had been made made way, way above our heads, and a long time ago. It was already turning into something far more cowardly, niche-marketed and PR-led. That’s why I left, for a start. I actually think this topic has some mileage in it, enough for a nice big well-researched piece in a decent mag or paper, interviews with the key players, where are they now, analysis of how/if the hype machine has changed etc etc. Of course, as Charles again rightly laments, there’s no one left to publish it. (Is there? What should we be reading these days??) Taylor and anyone else who wants to help set the record straight will have to go the 21st century route: Publish it all for free on their blog. I remember the whole thing quite clearly! I was about 21 at the time and living in a small town on the welsh border when I heard about ROMO. There was a small piece aired on TV first about the 80s new romantics and in the parting shots it had some scenes from a new London Club called Arcadia. When I saw the the melody maker piece after it had a massive impact on me. I hated all the boring traditional Oasis type shite that was about. Growing up on bowie and glam ROMO seemed glamorous, exciting and with a little imagination you could reinvent yourself and get involved too. So I did. I put a band together at the time called Apollo Nine. We were a cross between Blondie and Siouxie with some Numan type synths and a drum machine. We weren’t too good and we were more Goth that ROMO. I got a demo off to a bloke called “Hi-Fi” who lived in Heathrow and ran the ROMO night at club skinny. About a week later Stuart from Plastic Fantastic rang and said he liked the demo (which was funny cos we were giging under the name plastic fantastic locally until we saw the article and changed it). Hi Fi rang to give us a gig supporting Hollywood. I remember (being a wide eyed kid) going to the club the first time. It was a real eye opener! The girls from Hollywood were there and looked like two ice queens. There were two freakish twins in leopard skin dresses that looked like they’d come from a carnival as the Bettie page twins. One woman looked like an alien with orange hair, a green plastic dress, no eyebrows and these huge glittering green false eyelashes. Hi Fi and co were dressed in white suits like a synth pop Germanic fascist elite drinking cocktails. The guys from Orlando walked in and looked like the most suave people ive ever seen to this day. I remember seeing Simon Price dancing to soft cell with a multi colored Mohawk. The atmosphere was Uber Cliquey O.T.T glamorous and camp. Personally I loved it having been the only freak in a small town. Tony Hadley from spandau kept turning up hoping he could revive his career so a sign was errected outside saying “Tony Hadley F*** *ff”. Whether it was too early for the maker cover it had impact. Most people hated it but not all. There were a lot of people outside of London that wanted to get involved. I remember Hi Fi telling me about a ROMO band up north somewhere too. The main problem was that the scene was perceived as gay, elitist arrogant and the climate at the time was not warm to dressing up or synthpop. The music needed to evolve a bit too but i think most of the bands rushed into studios to record something quick and with the exception of Hollywood didn’t have a producer. But the funny thing was that the scene was so vibrant the music seemed secondary anyway. ROMO may have faired better if it had a Placebo (who hit the cover one year later looking ROMO) or a Synth act as cool as Goldfrapp (i think ROMO when i hear strict machine). Unfortunately it didn’t so its remembered for its spirit (and the rather embarrassing canceled ROMO UK Tour) rather than music. Musically the two bands that really had it together were Plastic Fantastic and Hollywood. Hollywood came down with Their Producer Dave Ball to play live. They mixed the live vocals with the backing Track on dat tape. No one seemed to care that the keyboard (they borrowed from us the support band) wasn’t even plugged in. The sound exploded and was cold and artificial, icy like the performance. The best performances though were from Minty who were fabulous with Nicola singing from the inside of a plastic bubble. They were the sort of band that could easily do a slot on eurotrash then fly off to hang out with Andy Warhol. So where are the Romo Sexuals now? Stuart from plastic fantastic I heard was at susex uni and is married. The singer from Dex Dexter starred in Velvet Goldmine (hes gfot huge backcombed hair and is in one of the bands in the film) and joined placebo on synth. Hi fi is probably still a club promoter if not a millionaire. Simon Price has a tabloid column and is still a working class noble. Brightons fabulous glam icon Boogaloo Stu used to hang out at skinny and now runs dynamite boogaloo niteclub and has two albums out. Apollo Nine split and became Pushka when ROMO burned, the singer is now a social worker, I wrote some theme tunes for tv. ROMO caused a massive fuss at the time, people didn’t like it and it devided opinion. Isnt that what the best scenes should do? Over 10 years on and people still talk about it. Romo was something that couldn’t be expressed very well without getting into complex discussions of synthetic music having soul but not being soul and oscar wilde but you either got it or not. You were just that type of person or not. Its funny though how the Romo front cover is probably the only one cover from the ninties you’ll recall! I actually stopped reading music weeklies because they dont experiment like they did back then. New Romantic espirit came back with Romo. I have some tracks from the Romo period and i think it´s amazing. I´m looking for photos of period but it´s impossible in net. In realy we didnt had to much information about Romo in Brazil at period, only a few number of photographs, an a few number of tracks but we had a nice new romantic scene here in the early eights and also a nice Romo nights in the 90. I think the only period of that decade to be remambered. Plastic Fantastic – Fantastic. Inaura – perfect. Minty – spetacular and Hollywood – brilliant. It was a very exciting period for us too. Yes, they did their period. After a delay of 13 years I finally bought the Plastic Fantastic single this week for 49p in a charity shop. I can see why It flopped, I can’t imagine Parklife era indie kids being impressed with Fantastique No5s weird vocals and I can’t recall it ever getting any airplay on Radio 1. 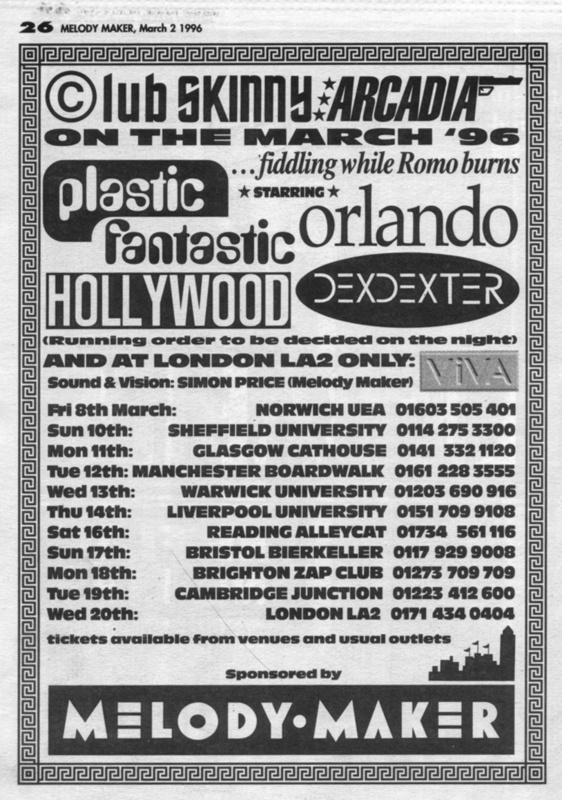 I saw Plastic Fantastic a few times playing at various gigs in Brighton pubs in 1995 & early 96,. They were a 5 piece then, they had a drummer who was a big burly bloke with a beard and a pony tail. He seemed to disapear around the time they got signed. The gigs always seemed well attended , although I do’nt ever recall seeing many actual Romo kids there. I was 23 when the Romo editon of Melody Maker was published and was already too long in the tooth to be taken in by the hype. Most of the bands seemed too heavily influenced by bands I’d disliked at school only a little over ten years earlier. However I can see there was a need for a change as Britpop was dead in the water after by spring 1995. At the time I thought Menswear I might of attempted to jump on the Romo band wagon , had it taken off. I recall their lead singer starting to look more Nick Rhodes than Steve marriott around that time. The only Romo or Romoish singles I liked were ‘Plastic bag’ by Minty and ‘Johnny chrome & silver’ by Nancy Boy.